The situation in Ukraine has continued to deteriorate to the point that it is simply simmering, Cassandra-like, in a morass of political and cultural dread as Russia slowly moves its pieces around the geopolitical chessboard, backing into a corner the feeble Ukrainian pro-European faction that toppled a notoriously pro-Russian president for a second time. Putin's Russia seems determined that this will be the last time that Ukraine resists the idea that it is wholly within the Russian sphere of influence. Scenes early in the growing crisis centered principally on the spectacular demonstrations in the large Maidan Nezaleshnosti (Independence Square) in Kiev, and the terms Maidan and Euromaidan have been used to designate the protests since, even those far from Kiev. The pro-European demonstrators compelled the pro-Russian President Viktor Yanukovych to seek an accord with the growing unrest and he announced a compromise, but the inertia of the demonstrations compelled him to flee, with the opposition in the parliament announcing a new government. Russia has refused to recognize the new government, calling it a coup, and Yanukovych eventually surfaced in Moscow, then Rostov, calling on Russian support. One of my Army sons surfaced just long enough to send me an excellent example of the atmosphere of these demonstrations in Kiev, scenes that place you in the middle of the turmoil and sounds and convey a real feel for the nearness of the Line of Departure as it were, showing the grim determination and anxiety of the demonstrators. Very few commentators and journalists have contributed anything worthwhile toward an explanation of how the situation has come to this. A brief explanation of what the Ukraine is may help to explain a large part of the contention. The political fight in Ukraine, an independent country for the first time after the collapse of the Soviet Empire (how I love that phrase) in 1991, is between the citizens of the native Ukrainian culture and the sizable Russian population in the country. There was a brief period after the country was established (along with the other fourteen ex-Soviet countries), when there was little time to do anything other than to adapt to the enormous change and try to work within the sudden and overwhelming complexities of the situation. There were glimmers of a move to a European-style sense of democracy that slowly began to be starved for oxygen. Pro-European politicians came to power after the Orange Revolution in 2004 that deposed the same Yanukovych after his election was found to have been subject to massive fraud. New President Viktor Yushchenko was elected but not before he was poisoned with a strong dose of dioxin that temporarily left him disfigured. Prime Minister Yulia Tymoshenko, of another pro-European party, is very popular within her bloc, but both she and Yushchenko were swept out again by the same Yanukovych in 2010, in an election that wasn't as flagrantly corrupt as before. Yushchenko was seen as politically ineffective and his popularity has plummeted, and Tymoshenko was imprisoned on corruption charges in what was widely seen as a kangaroo court. 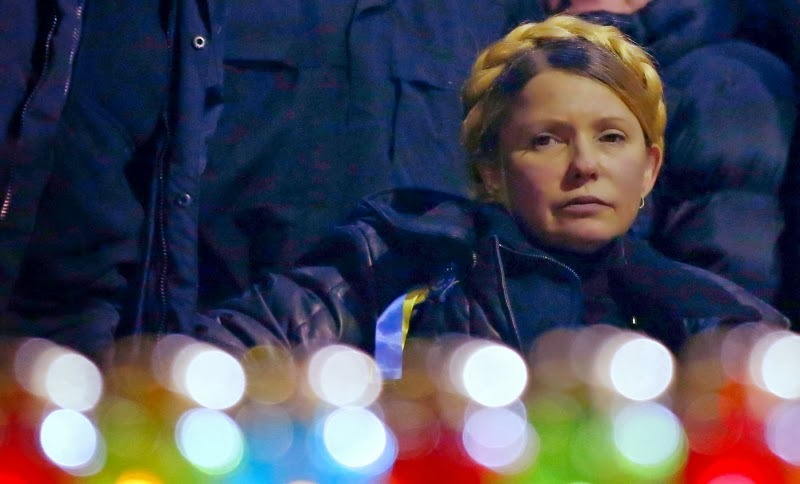 Imprisonment was not kind to her – she was released by the coup and addressed the protestors in the Maidan from a wheelchair, her face swollen. 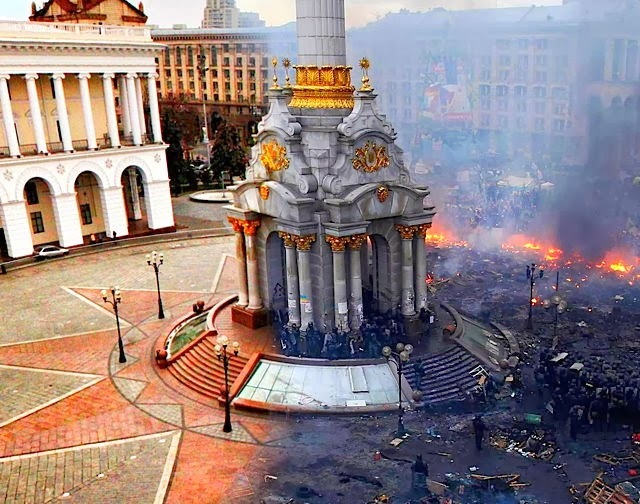 It is fitting that the protests began and escalated in the capital city of Kiev (or Kyiv, in Ukrainian). It is considered the 'mother of all Russian cities', centered in the ancient, almost near pre-historic times that saw a Slavic people living in a dominion of Varangian Vikings. This spawned the Russian culture, which eventually divided into the three subsets of Russia, Ukraine, and Belarus, earlier described even in my lifetime as Great Russia, Little Russia, and White Russia. Glancing at a map, the terms 'Great' and 'Little' carry an obvious explanation; 'White' derives either – or both – from the Slavic tradition of referring to cardinal directions by color – 'white' meaning 'north', and the observation that the population had a preponderance of blond-haired people. Ukraine is little compared only to Russia, but then anything would be, although it is larger than France as a comparison, and other than Russia is the largest country by area in Europe. The Ukrainian people developed as a result of a separate yet related history to Russia, dominated in the west by the Polish and Lithuanian empire for several hundred years. (I became intrigued by this history many years ago as a young man after seeing the movie Taras Bulba, adapted from the story by Nikolai Gogol, a pre-eminent Ukrainian author.) To the east, the border between Ukraine and present-day Russia is the one established over time with Cossacks and Khanates surviving from the early days of the Tatars. Russians moved from the north down along the mostly 'left bank' of the huge Dnieper River which divides the country, and some of the most populous areas of Ukraine (other than Kiev) are along the heavily industrialized east that grew during the days of the Soviet Union. The Crimean Peninsula, or simply Crimea, has a history of its own that belies its geography. Again glancing at a map, it would appear that Crimea is just as much a part of Ukraine geographically as anywhere else within its borders, but after its succession of Scythian and Greek settlements in ancient times, it came to be dominated by the Crimean Khanate, established by descendents of Genghis Khan, who came under the suzerainty of the Ottoman Empire far more easily than the Russians. Catherine the Great was responsible for taking it from the Turks and Tatars finally in 1783, an action that involved the Ukrainian people not at all, and it has remained staunchly Russian ever since, the more so after Stalin removed the remnants of the Crimean Tatars and moved them east at the end of World War II. After the break-up of the Soviet Union, some have come drifting back but not in enough numbers to seriously upset the demographics – Crimea remains some 60% Russian and 25% Ukrainian and only about 12% Crimean Tatars, and is classified as a distinct autonomous republic within Ukraine. It was these Crimean Tatars that first clashed with Russians in demonstrations in the Crimean capital of Simferopol. The main dispute over Crimea exists because of the fact that Nikita Khrushchev, an ethnic Russian raised in the Ukrainian culture, granted Crimea to Ukraine in 1954 when all was still safely contained within the Soviet Union, for the reason of solidarity and proletarian friendship. The gesture was realistically meaningless at the time as simply administrative streamlining – no one predicted the collapse of the Soviet empire only a few decades later – but it has come to haunt the current dilemma. The argument took on further significance with the large and historic Russian naval base at Sevastopol which headquarters the Black Sea Fleet. Russia retained the base after splitting off a few ships to comprise the small and rather insignificant Ukrainian Navy (their flagship is an emasculated Krivak-class frigate, and they have one Foxtrot submarine; the navy is little more than a Ukrainian version of the maritime arm of the KGB Border Guards from Soviet days, an attenuated Coast Guard). Though both fleets use the base, it is not without a comparison to the status of the US naval base at Guantánamo in Cuba. There was also a brief political struggle with Moldova over the large Russian port city of Odessa between Crimea and Romania, but that city and its environs, also populated by a large percentage of Russians, were retained by Ukraine in a Hobson's Choice. The country of Ukraine is thus divided between the native Ukrainian people to the west and north and the predominantly Russian people of the east and south, and the two cultures have been overlain with Tatars, Mongols, Huns and Poles. If one can say that the Ukrainians are influenced by their Polish/Lithuanian past, dominated by them from the 15th through to the 18th centuries, then also one must heed the observation that "if you scratch a Russian you'll find a Tatar." This extends back to the famous Alexander Nevsky of the late 13th century, who was faced with an invasion from the west in the form of the Northern Crusade by Swedes and Germans (like the Teutonic Knights), and the Mongol/Turkic Golden Horde to the east. Nevsky (that's Saint Alexander Nevsky if you are Orthodox) reasoned that the nations of the west sought to conquer the territory and bring the Russians under the foreign Roman church, whereas the Mongols only wanted tribute. He resolved to fight the invasion from the west and stopped it at the famous Battle of the Neva (thus Nevsky) and the Battle of the Ice, while acceding to the tribute of the Horde, an uneasy relationship (Moscow was sacked in 1382) until the yoke was thrown off by Ivan III the Great in 1480. Peter the Great some 300 years later was still trying to reverse the trend of looking east and bring Russia more into the culture of Europe. The Russians instead believed their Orthodox Church to be the Third Rome, after the fall of Rome to the Germanic tribes in AD 476 and the capture of Constantinople by the Seljuk Turks in 1453, and thus the Russian church inherited the mantle of the one true church. The split between Ukrainians and Russians is further riven by the contentious division between Catholic and Orthodox that has been so prevalent in Slavic Europe for centuries (cf Yugoslavia, disintegration of). Language enters into the distinction between Ukrainians and Russians as a measure of their distance and as an element of their respective cultures. Both grew out of a standard root, and they remain quite similar but different enough to be immediately recognizable. Just as English has been strongly influenced by the Latin of the Roman occupiers under Hadrian and French since the Norman Conquest, so too has Ukrainian been influenced by Polish, Serbo-Croatian, Czech, German and even Latin. By the 17th century, there are accounts of translators being used during negotiations with Russians (themselves influenced by Mongol and Turkic and the evolving of their native language by their isolation). Both Russian and Ukrainian use the Cyrillic alphabet but with variations in some letters and their pronunciations. Language, religion, separate ancient orientations – these are a few of the distinctions that lend themselves to the argument of a clash of civilizations (a perspective lately attributed to Samuel Huntington), despite their remaining similarities. 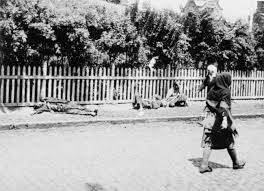 But Ukrainians have also suffered under Russian suppression in the 19th century, and the excesses after the Bolshevik Revolution. It was a burned-over territory in the ensuing Civil War between the Communist Red Army and the Monarchist White Army under General Pyotr Wrangel as well as a home-grown Anarchist Black Army under its commander Nestor Makhno. The sudden fall of a strict dictatorship is typically supplanted by the only remaining organizations available at that time: the black market and organized crime. This has been no less true in Ukraine than in Russia, and corruption, bribery and nepotism as a way of life are found everywhere. A thrust to work themselves out of this political swamp was for the Ukrainians to ally themselves with the European Union, but the price of admission is steep. The EU, in its turn, is not in a position to grant favors, burdened as it is with the staggering problems of its nanny-state economies of Greece, Cyprus, Italy, Spain, Portugal, Ireland and even France to some extent draining what is left of the active economy of the EU (otherwise known as 'Germany'). If the EU has to tell Greece that the larder is empty and the Greeks will have to put their own house in order, however painful that may be, it can't then make a generous loan to Ukraine. The Ukrainian economy is down by some $30 billion, and the EU responded with the possibility of some €625 million ($868 million), along with the IMF demand for painful restructuring that simply isn't going to happen anytime soon, assuming the political will to overcome decades of the sclerotic Communist bureaucracy. Putin, on the other hand, offered an immediate $15 billion and cut rates on the plentiful Russian natural gas flowing through pipelines that connect Russian gas fields and anxious European customers. Despite our warnings to Europe some twenty years ago, Russia is in a place to make Europe freeze by cutting off the more than 40% of the natural gas on which Europe depends, and the Russians have already demonstrated that they have the will to do so by shutting down the supply to Ukraine a few years ago in a earlier dispute. Nevertheless, the momentum in the Ukrainian parliament and certainly with the western Ukraine was to move into the European sphere somehow, yet it was Yanukovych who suddenly signed a sweetheart deal with Putin. It was this that caused the latest eruption in the Maidan. It is no wonder, just based on this brief précis alone, that there are sharp distinctions between the two sides. The momentum of the issue, though, has now been driven by the response of Putin and promises to continue unabated. Each step in this process has been an attempt to return Ukraine to the control of Russia, with Russian despot Vladimir Putin slowly consolidating the Russian Empire again. It is Putin, after all, who said that the "demise of the Soviet Union was the greatest geopolitical catastrophe of the [twentieth] century." It is blindingly obvious that he fully intends to re-unite the Russian Empire under his control to the maximum extent possible, while demonstrating to the world at large that he has the power to do practically anything he wants with relative impunity. The Russians have moved within the last few days to secure Crimea. Troops in standard field gear, sanitized of rank insignia or distinguishing markings, began appearing in strategic places to secure the area. 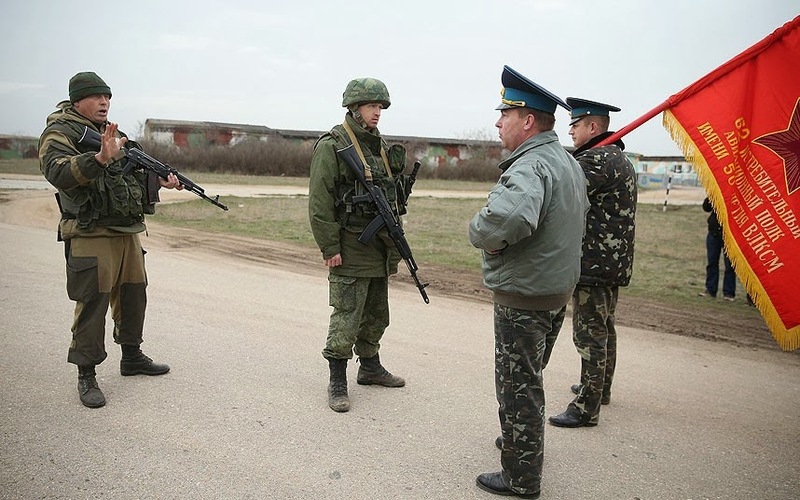 The Russians replied when asked that these couldn't be troops from the Russian armed forces – they must be local units of a peoples' militia, they said. Journalists at first would pass that canard along without comment (and some continue), but it is absurd to believe that so many of them (their movements make it difficult to pin down a number but a current estimate puts six thousand in Crimea), equipped with the same basic uniform and field gear, all armed with standard Russian weapons, could be anything but Russian troops. Consider also (for the journalists do not) that this supposed peoples' militia move around in trucks with Russian military plates and markings only barely obscured, along with armored vehicles and helicopters. That is certainly more than a neighborhood watch. There are some uncorroborated reports of movements elsewhere but the action for the moment seems to be limited to securing Crimea. 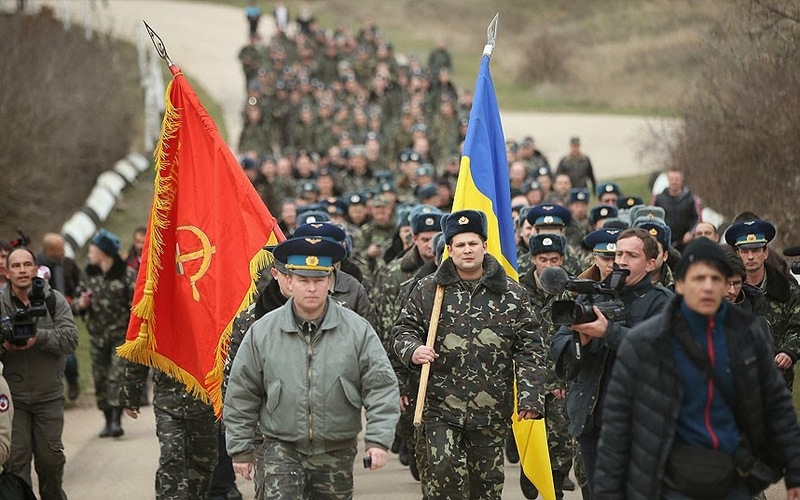 The land connection between Crimea and the Ukrainian mainland is a web of marshes, lakes, and bays, with the only two roads secured with those same nondescript troops and Cossack militia. Well-made signs have been erected telling Euromaidan protestors to turn around and go home. Ukrainian troops (what few there are) have been caught off guard, and appear to have copied the US Army weapons policy of Pearl Harbor prior to 7 December 1941, in that all weapons were secured in armories, now in possession of the Russians. A few small reserve bases are surrounded with Ukrainian troops inside, and the Russians around them seem content at the moment to wait them out, a quiet siege that avoids the tinder spark of shots fired. The Ukrainian military is practically useless to address this incursion. The Navy as I said above is a minor flotilla of gunboats, and its commander has already surrendered. The Air Force has some few examples of somewhat modern equipment and aircraft but it has never been funded anywhere near an adequate level. Upkeep has been done almost entirely through cannibalization, and less than ten percent of the aircraft can likely even launch. Training has been practically at a standstill. Likewise the Army – over the few years of Ukraine's independent existence, the Army has been reduced to some fifteen brigades and some ancillary regiments (air transport, artillery), communication equipment is antiquated and unreliable, soldiers are paid a pittance, and it is incapable of mounting anything like an adequate organized resistance. The Russian Army trumps it at every turn. Other governments demand answers about this incursion, but Putin ignores them. The world is surprised, with the Western intelligence services caught off guard and our own CIA with another failure. Putin saw no reason to engage in talks or even hint about his prospects beforehand – he didn't need to. Putin doesn't talk – he acts, and even the few responses about the troops in Crimea, like they are some sort of upscale Blackwater, are obviously false and that is part of the joke. He is laughing at the West's (and certainly our) inability to respond. A key example of the dichotomy between us is that the Russians fired off an ICBM test just yesterday, likely to punctuate the fact that they are beholden to no one and don't care that they ramp up the anxieties of the West still further. The US just recently cancelled such a test because we were concerned about the reaction of North Korea. Obama is concerned about the sensitivities of Kim Jong Un; Putin doesn't give a damn about what Obama feels. 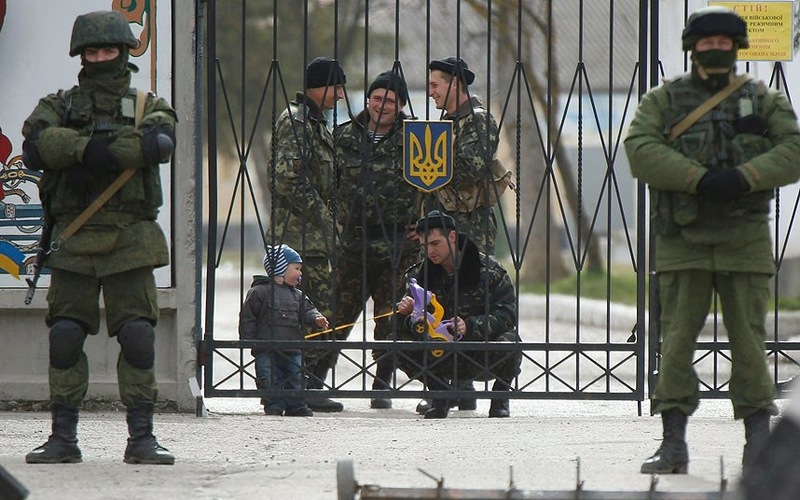 No one is going to be sending troops into Ukraine, the belly of the beast. Even if that was a necessary response, the American military is the weakest it has been in decades, and part of the Russian joke is that the operation began within a day of Defense Secretary Chuck Hagel announcing the latest severe cut to the US military, downsized to its lowest level since before World War II, at a time when any historian worth his salt agrees that our feeble size then (Romania had a larger army) simply invited our enemies to grab power at our expense. And of course the plan is to reduce our military still further each year out to 2024, with the Sequestration set to take half of each year's cost savings out of the military that constitutes only 19% of the federal budget. European militaries are a shell of what they need to even defend their home ground. Some contributions of mostly excellent troops in small numbers have aided in the operations in Iraq and Afghanistan, and Operation Olympia against pirates in the western Indian Ocean, but they have done so with American aid and massive logistical support. Even the French troops fighting Muslim insurgents in Mali, Chad, and the Central African Republic have done so only with the aid of air transport supplied by the US and UK. A military option in Ukraine is completely off the table. 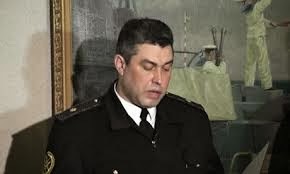 Likewise, talk of sending a warship or two into the Black Sea would be futile as well, sailing around under the watchful gaze of the Black Sea Fleet until its turn comes up to return stateside to be mothballed. Yet again, our intelligence services are caught flat-footed, with no clue about the impending action. One source said that the 'tell-tale movement of hospital units' wasn't seen, but I would expect that lame excuse from some transport battalion S-2, not the CIA. Deputy National Security Advisor Tony Blinken candidly admitted that he "hadn't a clue" about Putin's intentions. Andrea Mitchell of CNN surprised John Kerry with the news that Putin denied that there were Russian troops in Crimea, several hours after the announcement. I've always had a low opinion of State Department intelligence, but who is supposed to be keeping the Secretary of State up on the latest developments, much less news several hours old? Our knee-jerk reaction is to threaten, but with what? Sanctions are rattled rather than sabers, but we see time and again that sanctions, when they have any effect at all, can take years or decades to bring the parties to the table, and then have them talk us to death with no accomplishments(cf Iran, North Korea, now Syria, and Saddam's Iraq for a time before we finally called his bluff). Administration pronouncements, echoed by the media of course as if they were factual, portrays a Putin who is somehow seeking an "off ramp" to the problem, with no evidence other than what they perceive as his tone of voice. These same reports draw their conclusions based on the dip in world markets, as if the Russians hadn't already planned on that clear eventuality. In all likelihood the market will rise again once the dust settles right where Putin wants it to be, and Europe incapable of being unified by the American "lead from behind" administration will go back to business as usual, if somewhat cautious. Putin has already counted up the advantages and disadvantages of the action he has taken, and shows again the old observation that Americans play poker while Russians play chess. John Kerry's meeting with Russian Foreign Secretary Sergei Lavrov yesterday was a waste of time. Hagel announced the dispatch of six F-15s and a tanker to reinforce the four F-15s already on rotation in Lithuania, but all that we are doing in the short run certainly is mere window dressing. Mind you, I'm not condoning the Russian actions, just pointing out the reality of the situation. The Russian attitude, in Russia and Crimea, is that Crimea has been staunchly Russian for well over 200 years, and other than the blithering administrative miscalculation of Khrushchev sixty years ago, it is unquestionably Russian again. I don't anticipate that Putin will escalate the problem still further, but remember that he took the same action in the Transnistria of Moldova and with a limited invasion of Georgia to break off the pro-Russian enclaves of South Ossetia and Abkhazia. 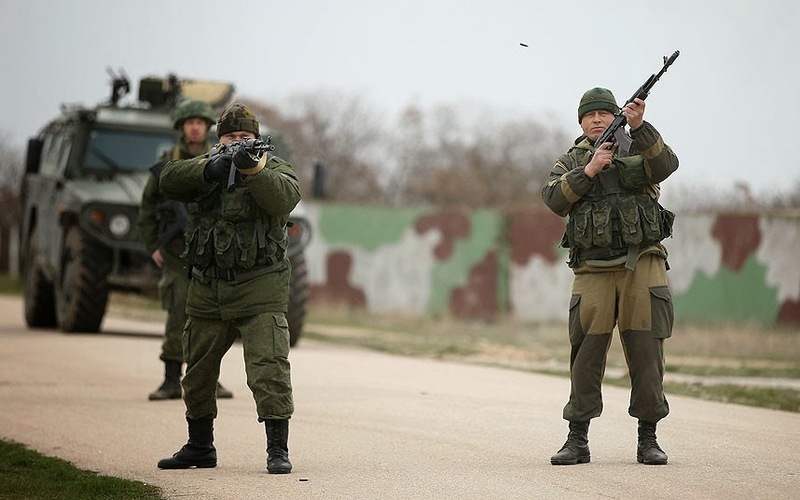 Putin has said that he has no plans to annex Crimea back into Russia, but we've seen that game played before too – just a few hours ago there were reports that Crimean Russians are petitioning to do just that, giving Putin a passive excuse for the same. In each of those cases, the Putin doctrine seems to be the "protection of ethnic Russians". Has anyone taken note that there are still sizable populations of Russians remaining in the Baltic states of Estonia, Latvia, and Lithuania? The Baltic states have been adamant about separation from the former Russian hegemon, and have taken the step of joining NATO, but who knows what encouragement Putin might have with them, or elsewhere? And in case anyone hasn't noticed as well, Assad in Syria is well off the screen now with its Russian interlocutor being ostracized.